Boring, sleepy study halls can be brutal. In fact, if you don't have enough work to occupy you, study halls can be enough to stop your school day dead in its tracks and make time slow down to a painful crawl. We've all watched the minutes on a clock tick by at what seems like the slowest possible pace. But, given all the excitement constantly happening at Super Hero High, you’d imagine the students must long for the occasional dull moment and rest from evil-minded plots. 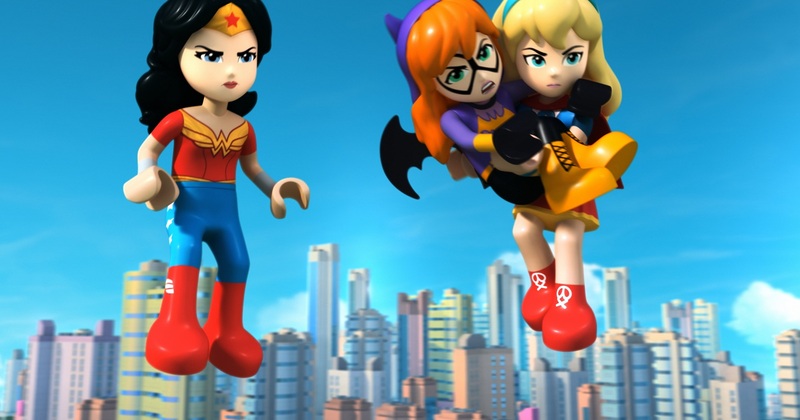 They certainly don't catch that break in LEGO DC Super Hero Girls: Brain Drain. The new animated adventure, available digitally and on DVD now, sees the Super Hero Girls collide with the world of LEGO. The entire planet is in peril as Wonder Woman, Supergirl and Batgirl have to battle an unknown villain as well as short-term amnesia. The trio thought they all had the same bizarre dream where they witnessed Katana and Bumblebee stealing diamonds. They gave chase, but then they all woke up. Turns out the events didn't only happen in their heads, and the three girls slowly started to understand they lost some time—a whole day. Luckily for them, others remember their missing 24 hours. The trio of girls all acted extremely out of character, doing things like uploading an embarrassing video of Harley Quinn without her permission and replacing the school's Amethyst with Principal Waller's car. Their activities get them expelled. That makes them realize not everything is as it seems and deeper digging leads them on a chase towards the hidden mastermind behind the plot, Eclipso. Eclipso doesn't give up easily, does she? We last saw her in DC Super Hero Girls: Hero of the Year working alongside Dark Opal. She has a single-minded desire to return to Gemworld so she can rule; she has the whole wanting to control a world level ambition in common with a lot of villains. To execute her vision, which incidentally includes the destruction of Earth, Eclipso taps Lena Luthor to help her. Lena definitely delivers; she even comes up with a method of mind-control for her cohort to use. She's a valuable and malleable ally for Eclipso. With their combination of scientific knowledge and magical powers, they make a formidable duo—one worthy of the efforts of the Super Hero High students. They're almost too much for Wonder Woman, Batgirl and Supergirl to handle. Almost. The girls have faced dangerous enemies before and emerged triumphant, but this time it's different. How can they cope when their nemeses are controlling the minds of their friends and even their teachers and Principal Waller? It's the challenge they have to confront in Brain Drain. To make an effective stand, the girls have to unite and use their various talents together like never before. Their actions in the movie, like in other DC Super Hero Girl stories, emphasize how important it is to stick beside your friends—even when one of them (cough, Supergirl, cough) is acting out while under the influence of red kryptonite. It's particularly important for the girls to stand by their besties what with the whole mind control business. Lena's machinations turn Bumblebee and Katana into wrongdoing thieves ready to go all out in combat against their friends. They don't really have a choice other than to defend themselves, but they keep faith in their buddies. The hero vs. hero conflict makes the Brain Drain action nonstop and fierce. Watching how the powers of the characters translate to the LEGO format adds an unexpected layer to their encounters. The look for Brain Drain is obviously different than any of the other DC Super Hero Girl movies. Turning the girls into LEGO minifigs means seeing their talents play out in inventive ways. They have to leap into action—and everything else, for that matter—without thumbs. And with a world made of LEGO bricks, crashing into buildings becomes extra risky. Though the stakes are as high as they can be with the fate of Earth on the line, the girls still have plenty of humorous moments. Four words: pot pie eating contest (side note: where can we sign up for one of those?). They lean into the humor and gags made possible by the LEGO setting, making Brain Drain one of the funniest DC Super Hero Girls stories yet. Just as key as working together is knowing your strengths and understanding what your friends are capable of handling. You can and should boost a friend when you realize they're better suited to handle a situation. For example, when Supergirl and Wonder Woman are put in a position where their powers are being drained, they turn to Batgirl for assistance. Her sharpest skill is her mind, which can't be affected by Eclipso's magic. She can do what Supergirl and Wonder Woman can't in that moment. It's a constant and meaningful message in DC Super Hero Girls that everyone is extraordinary, regardless of whether they possess super abilities. We can all embrace who we are and get our cape on. "Batgirl at Super Hero High" Thinks its Way to the Top! Who Will Be DC Super Hero Girls' Hero of the Year? The Official DC Super Hero Girls Mobile App Is Here! Who are the DC Super Hero Girls?